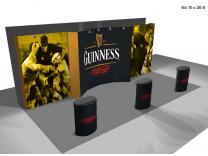 Kits for 20 Ft VBurst Booths: The 20' VBurst Booth Kits provide the exhibitor with a wide variety of attractive styles and layout to consider when pruchasing a 20 foot VBurst booth package. The VBurst pop up displays product is ideal for a company whose message can be developed using large format graphics to visually attract those walking buy. Not only is the VBurst 20' booth dynamic, but also affordable which subsequent replacement graphic purchases only a fraction of what normal Lambda output graphic panels are for normal pop up displays. 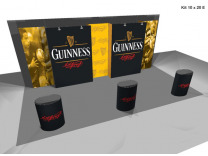 ShopForExhibits, a long time distributor of trade show displays, continues to broaden its' web site product lines with improved product offerings such as trade show flooring, and the exciting new trade show exhibits in the custom modular hybrid displays line. To keep pace with the business activity they expect in the future, ShopForExhibits.com has just gone live with an entirely new web site which presents prospective customers with an elevated level of product information along with product videos and product templates. Due to the current economic climate, that is anything but predictable, online retailers have to be flexible in what they offer the buying public as well has being aware of the declining price point that organizations are able to pay for trade show related merchandise. 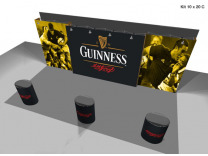 Successfully bringing new products to market such as the new tension fabric displays, isn't as simple as one would think, but due to the years of experience with display products and internet marketing, ShopForExhibits.com has positioned themselves to lead the pack and be a successful competitor in this industry.